Kushtia: 25 March. Farmers of Kushtia are outraged. Tobacco farming is not only destroying soil, forsts, environment, ecology and conditions of survival, but financially ruining the farming community. The tobacco companies are now refusing to pay farmers what was originally promised to allure them to cultivate tobacco, instead of food crops. Both local and transnational companies are using fertile lands for non-food cash crop creating severe food crisis and environmental disaster. This is an issue that must be addressed immediately by the policy maker.The Tobacco companies particularly the British American Tobacco Company (BATC) and other local companies allured the farmers to cultivate tobacco in the tobacco planting season by announcing a higher rate for the leaves. They declared Tk. 150 per kg of tobacco leaves. The farmers were encouraged by such announcement and cultivated tobacco in the land where they used to grow food such as potato, lentils, pulses, mustard and winter vegetables. The company's contract farmers as well as general farmers cultivated tobacco. The villages in Bheramara, Daulatpur, Mirpur upazilla were full of tobacco, and no food crops. In March, the tobacco farmers start harvesting the tobacco leaves. Harvesting of the leaves starts from the lower part of the plant. In the beginning, the farmers could sell the leaves of the lower level of the plants called "gor pata" at Tk. 120 per kg. Although it was much lower than the declared price for leaves, the farmers expected that the price will increase for the middle leaves or "Majher pata". Usually BATC and other companies buy tobacco leaves from the local buying Houses. But this year they did not purchase any tobacco from the local buying houses. The Contract farmers of BATC had to take the leaves to the depot at Allardarga in Bheramara of the company. 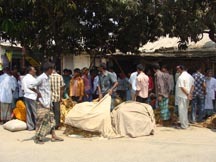 The contract farmers of Dhaka Tobacco sell the leaves at the depot of Pipulbaria. The rate previously fixed for this year (2010) was Tk. 110 - 115 per kg. But when the farmers took the leaves to the depo they were given only Tk. 55 - Tk. 70 and outside the depot these are sold at Tk. 40 - Tk. 45 per kg. So the farmers are not able to get better price for their produce and are feeling miserable because they cannot even recover the cost incurred for the cultivation of the tobacco. This was a company manipulation of price as they have seen that there is abundant supply of the tobacco leaves and the farmers have no alternative but to sell at the price fixed by the company. Tobacco is not a food crop, so there is no point for the farmers in keeping them for household or local consumption; they also could hope of getting a higher price. Tobacco market is a monopoly market, farmer's have no choice but to to depend on the company. Terms of the market are decided by the company. The farmers felt betrayed and are outraged by the company which allured with promises of higher price and then not buying the leaves from them at the price promised by them. So they have made effigy of the company with Lanten in their hand (to go away) and a bamboo in their back (farmers are throwing them away). This has happened in Kushtia during 23 to 25th March, 2010 in different villages of Bheramara.